Just because we write about movies here at Cinecultist, doesn't mean we have "good" taste. That's our round about way of saying that despite the abysmal tv promos for Alex and Emma, we'll probably see it this weekend. Moviefone has a cute feature comparing the Wilson Brothers (Luke and Owen), whom we think are both adorable. 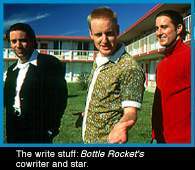 If you haven't seen Bottle Rocket, we recommend it highly as they both star, it's the first Wes Anderson/Owen Wilson collaboration and it's sure to be better than both Alex & Emma and The Big Bounce (Owen's next picture with Morgan Freeman as his co-star) combined.